It’s not often you come across a real-life mad scientist. 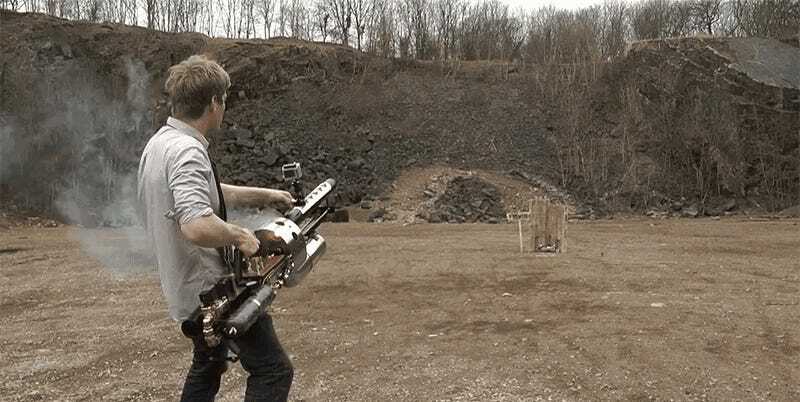 They’re usually just over-the-top antagonists in comic books, but Colin Furze is the real thing. He has a penchant for building things that often blow up—on purpose—like this impossibly dangerous-looking thermite cannon. Not familiar with thermite? It’s an especially nasty chemical composition made of metal power and oxide that burns as hot as 2,500 degrees celsius. If it ignites, you don’t want to be anywhere near it, which is why a cannon that puts a lot of distance between you and a flaming thermite grenade isn’t the world’s worst idea. It should go without saying that building your own thermite cannon is a very dangerous undertaking. But watching a trained... err... professional like Colin build his is still quite entertaining. And you might even learn something about why thermite isn’t exactly something you want to be playing around with.